Spring is here and can mean not only beautiful weather but also a runny nose and itchy throat. Allergies mean that your immune system is working overtime. They’re on the upswing since longer summers and warmer winters mean an extended growing season and more pollen in the air. 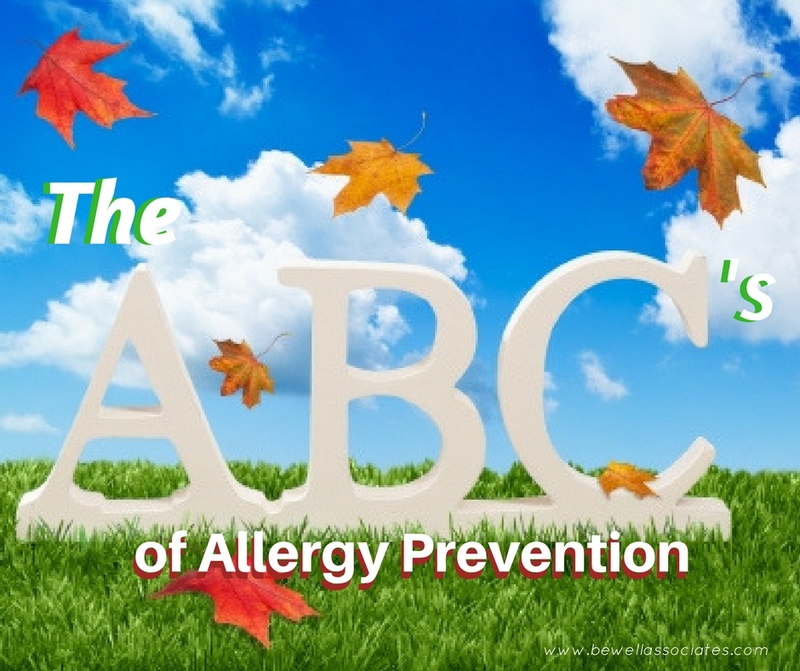 Read through the ABCs of allergy prevention and take the holistic approach to control them. Add to your list until you start to see a decrease in your symptoms….which should hopefully be soon! Allergies The first time you encounter an allergen, your plasma cells release IgE (immunoglobulin E), a “soldier” specific to that allergen. These IgE antibodies attach to your mast cells on your skin, the mucous membranes of your nose, and any tissues that interface with the external environment. Future encounters with a particular allergen cause the mast cells to release chemicals such as histamine, leukotrienes, and prostaglandins. These chemicals cause the miserable symptoms of allergies: sneezing, runny nose, sore throat, hacking cough, itchy eyes, etc. Pollen is an extremely common mast cell activator, but there are other triggers: mold spores, dust, dust mites, airborne contaminants, dust mites, pet dander, cockroaches, environmental chemicals, cleaning products, personal care products and foods can all cause allergic reactions. Every person’s reaction is different. Acupuncture Weekly acupuncture treatments have a significant effect on breathing, although only short term, so are especially helpful to those who have a seasonal allergies and would need the treatments over only a short time. Our favorite local acupuncturist in the State college area is Jane Weaver, M.Ac. or Heather Ferlitch, D.C., M.S., L.Ac., Dipl. Ac. Bedding Wash your bedding in hot water: 140F water removes 97 percent of pollen from laundry, compared to just 69 percent removed at 86F. Close your windows At home and in your car to prevent small particles like pollen and dust from entering. Decongesting Foods Eat more foods that clear your sinuses: hot chili peppers, horseradish, garlic and hot mustards. In fact, a nasal spray containing capsaicin (derived from hot peppers) significantly reduced nasal allergy symptoms in a 2009 study. Eye drops. Eye drops can both flush the pollen out of your eyes and re-moisturize them. Food Allergies Aggravate respiratory allergies by increasing the total load of allergens your body has to manage. Find out if you have any by checking IgG antibodies through a blood test. These allergies are often silent since reactions can occur 48 hours after eating an allergenic food, so it’s hard to connect your symptoms with the food. Consider testing for the “hidden” food allergies using our Comprehensive Food Allergy testing. Green Tea (or any tea) Holding your face over a hot cup of tea is soothing and can open your nasal passages. The menthol in peppermint tea is especially helpful as a decongestant and expectorant, breaking up mucus and clear it out of your nose and throat. Honey Eat local raw honey that has the local pollens and propolis, etc., intact. Bees transfer pollen from flower blossoms to honey, so eating the honey daily may help inoculate against the local pollens. Think of it as an allergy shot! Some people swear by this and eat local honey wherever they travel. Ionizer/Air Filter combination Removes irritating particulate matter and kills molds. Have one in your bedroom and occasionally run it in your living area as well. This is a better investment than expensive whole house duct cleaners. Know the differences between allergy meds If you have applied all the suggestions in this article and still have problems, you may need to try a medication. Antihistamines calm down your body’s immune reaction to allergens like pollen or animal dander. Allegra, Claritin, and Zyrtec are all antihistamines and all have different active chemicals with different effects, so find the one that works best for you at the lowest dose. Claritin is loratadin, Allegra is fexofenadine, and Zyrtec is cetirizine. In a nutshell, Allegra is the least likely to make you drowsy. Claritin is longest-acting, with effects up to 24 hours. And Zyrtec acts the fastest — usually within one hour — but is most likely to make you drowsy. Claritin-D, Allegra-D, and Zyrtec-D also contain a decongestant, which reduces congestion by narrowing the blood vessels inside your nostrils. Leaky Gut The cause of hidden food allergies and can make respiratory allergies worse. It can often be the cause of chronic post nasal drip. Leaky gut is a condition where the lining of the small intestine becomes permeable and allows particles of undigested food, bacteria and metabolic wastes that should be confined to your digestive tract to escape into your bloodstream. As you can imagine, this increase in toxic substances in your bloodstream creates significant inflammation. The proteins themselves are large complex substances that are antigenic and allergenic, meaning they stimulate your immune system to produce antibodies against them. This is what sets the stage for the occurrence of allergies and even autoimmune disorders. Neti pot Use to rinse pollens from nasal cavities and to keep dry nasal membranes hydrated. Omega 3 fatty acids Potent anti-inflammatories. Eat more animal-based omega-3 fats from grass fed animals and wild fish to increase the full range of Omega 3’s: EPA, CLA, DHA. Probiotics The “bugs” that populate our entire digestive tract.Increasing the “good bugs”, or helpful bacteria, is an essential way to support immune health since 80 percent of our immune system is in the gut. In a 2008 study, researchers discovered that people who took probiotics throughout allergy season had lower levels of an antibody that triggered allergy symptoms. They also had higher levels of a different antibody thought to play a protective role against allergic reactions. There are some specific strains of bacteria that are particularly effective against respiratory allergies which were developed specifically for allergy relief. Look for a product that includes L.parcasei and L. plantarum, such as our Ultra Flora Immune. Quercetin and Nettles Quercetin is a powerful antioxidant called a flavonoid. There’s some research that suggests that quercetin-rich foods (such as apples, berries, red grapes, red onions, capers and black tea) prevent histamine release. Quercetin is also available in supplement form—a typical dose for hay fever is between 200 and 400 mg per day. Stinging nettles are another classic herb in the flavonoid class, and reduce inflammatory chemicals that counteract both allergies and arthritis. We carry Hista Eze, which is a botanical that contains these active ingredients and more. Rutin Another bioflavenoid, found in the rind of citrus fruits- so don’t thrown away the white layer on your oranges. They are superfoods that help suppress allergy reactions. Sunglasses Wear large ones that keep pollen away from your eyes — and you’ll look glamorous, too. Vita C and Vita D The workhorses of the immune system….everything immune does better with good levels of these nutrients! Have your Vita D tested and make sure you’re in the 60-70ng/ml range . Our D Supreme provides 5000ius Vita D, balanced with Vita K. The D Ultra is 10,000 ius. During allergy season take 1500-2000 mg Vita C, such as our Stellar C, which provides Rutin and other bioflavonoids . If it bothers your stomach, use a buffered C to get that amount, such as our. Buffered Vita C Powder. Water Sometimes simply diluting the histamines reduces allergy symptoms significantly. Drink at least half your body weight in water each day. So if you weigh 150 pounds, you need 75 oz. of water per day. X Cross reactivity Occurs between hidden food allergies and pollens. If you’re allergic to ragweed, for example, you may have cross-sensitivity to melons, bananas, tomatoes, zucchini, sunflower seeds, dandelions, chamomile, and Echinacea. If you have a grass allergy, you may also react to peaches, celery, tomatoes, melons and oranges. For tree pollen allergies, avoid fruits like apples, pears, and peaches, as well as almonds and hazelnuts. Obviously you’d want to avoid these foods, especially when the pollen count is high. You may be able to tolerate these foods “off season”, when your allergies are quiet. Your cell phone Turn it off! Or get it away from your body. A study published in Archives of Allergy and Immunology, found that one hour of continuous cell phone use exacerbated allergic responses to dust and pollen, suggesting that microwave radiation may somehow make allergic reactions worse. Zinc Another prime immune system supporter, necessary for senses of taste and smell, wound healing (think, repairing the lining of the sinuses and lungs), normal growth and development. Consider Zinc-Zyme or if you need a higher dose, Zinc Citrate, both easily absorbed.